An escape room is a timed game in which players solve a series of puzzles and riddles using clues, hints, and strategy to finish the task before time runs out. 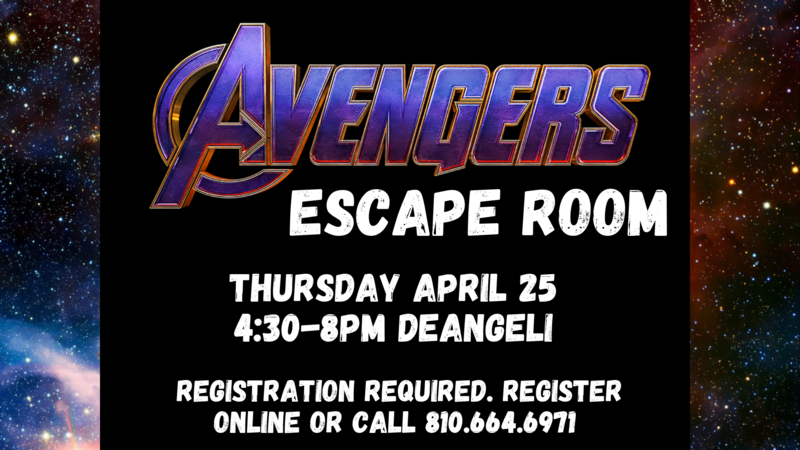 The escape room will run four times throughout the night, with players having 30 minutes to figure out the clues to help the Avengers save the world. This program is teens and adults and registration is required. Participants will be asked to select a specific time when registering and should show up 10 minutes before their chosen time. Players arriving after their requested time will not be allowed to join an on-going game. Register online or call the deAngeli Branch Library at 810-664-6971 for more information about the program.